LET US DO THE TRAINING FOR YOU! Our Home Alone Day-Training Program℠ offers the convenience of in-home private sessions while you are at work or otherwise occupied. 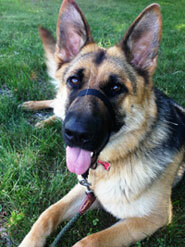 We spend three sessions per week (30-45 minutes each) with your dog until your desired training goals are met. We also help you implement appropriate management and intervention strategies for immediate relief and improvement during the course of the Program. Transfer sessions provide your family with the necessary tools to apply and maintain desired behaviors. Written progress reports and video keep you in the loop between transfer sessions. Your dog gets the training he needs as well as mental stimulation and quality time (and perhaps even a much needed potty break)! Perfect for rowdy adolescent dogs, young puppies, doggie socialization and reactive dogs. Certain distance restrictions may apply. For more information and pricing, click here to contact us by email or to schedule a free 15 minute phone consultation. Day-Training has been a tremendous help to our family. Not only did Anna & Casey love the structure, but the convenience is beyond words. Leslie does all the hard work and then transitions the lessons and commands over so you can keep the momentum of learning going. Highly recommend the training to anyone who needs help with their dog training but cannot attend a class, etc. We have seen a huge change in our girls in just a few months. There is no way we could have handled this on our own and would never have been able to get these type of results so quickly without Leslie’s help. We could not be happier. We initially hired Leslie to address Roxy’s concerns with strangers and to teach her basic manners. We weren’t certain if training would help her social issues, since Roxy was already 10-months old and hadn’t been exposed to people outside of our family. But we began to notice steady improvement early on and Leslie continues to work closely with Roxy and our family to this day. Her patience, kindness and professionalism are second to none. We highly recommend her!!! As a single guy with a demanding business schedule, Day-Training has afforded me the piece-of-mind in knowing that key elements in Mike’s development – basic manners and socialization – are being met. Mike has learned essential commands, such as WAIT at the door and DROP-IT and has been coached thru specific fears involving the car, water (baths), stairs and novel environments. Regular outings have been instrumental in assuring a well-socialized Rottweiler, both with people and other animals.